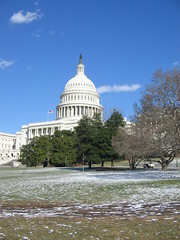 The above strip is a 360+° panoramic stitch of photos I took from near the Capitol yesterday afternoon on my way to work. Get it at full size if you dare. More post-snow photos follow, and here’s a full photoset for both times it has snowed significantly so far this season. 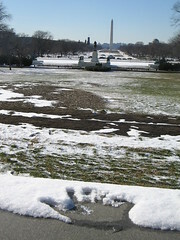 As you can see from the handprint and the scattered thaw on the Capitol lawn, we really didn’t get a whole lot of fluff downtown, but it was enough to make things briefly pretty for a morning.